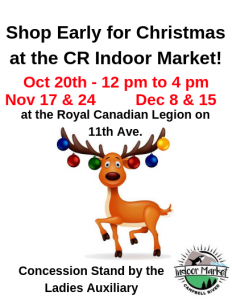 Join us at the Campbell River Indoor Market at the Royal Canadian Legion on 11th Avenue. We have a wide variety of vendors. Purchase an item and put your name and phone number in our draw that will be at every market. Santa Claus is coming to town in November and December.